Honoring George Harrison: Randy Bachman's Track-by-Track Breakdown of New Album, 'By ... . Beatles Radio: The Beatles, Solos, Covers, Birthdays, News The Fab 4 and More! 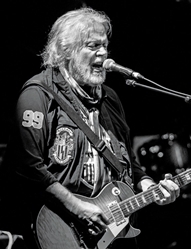 Before he found fame with the Guess Who and Bachman-Turner Overdrive (BTO), guitarist Randy Bachman cut his teeth playing in cover bands around his Canadian home town of Winnipeg. This was where his lifelong admiration of George Harrison crystallized. Many decades down the road, Bachman decided to relive that experience on his new album, By George, By Bachman, a collection of 11 songs written by George Harrison with one track, “Between Two Mountains,” that Bachman wrote as a tribute to the former Beatle, who passed away in 2001. Had he lived, Harrison would have turned 75 this year, and Bachman celebrates his own 75th birthday this September 27. So the timing seemed ideal to Bachman, who takes a very freehanded approach to Harrison’s compositions on the disc, departing markedly from the original chord progressions, melodies and grooves. But he feels that Harrison would have approved.